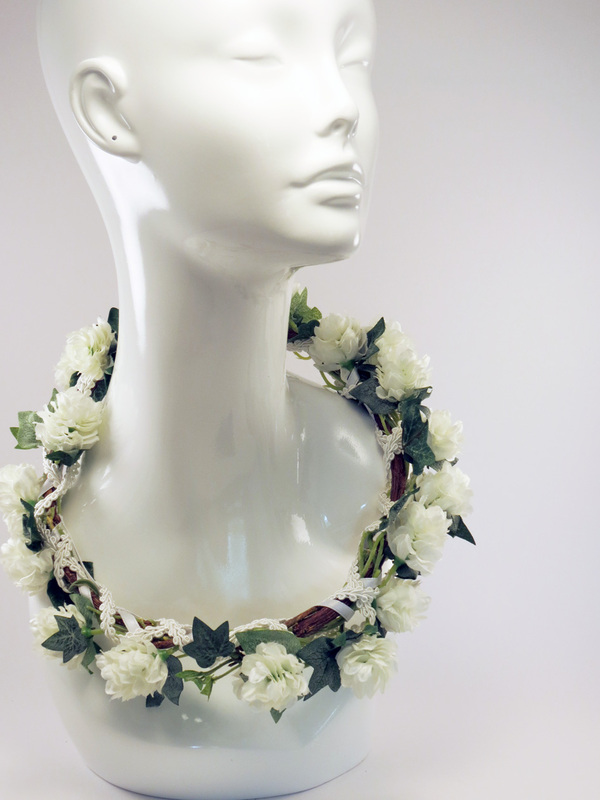 Someone asked me about making a floral crown, so I thought I would give it a try. Here is my first attempt. 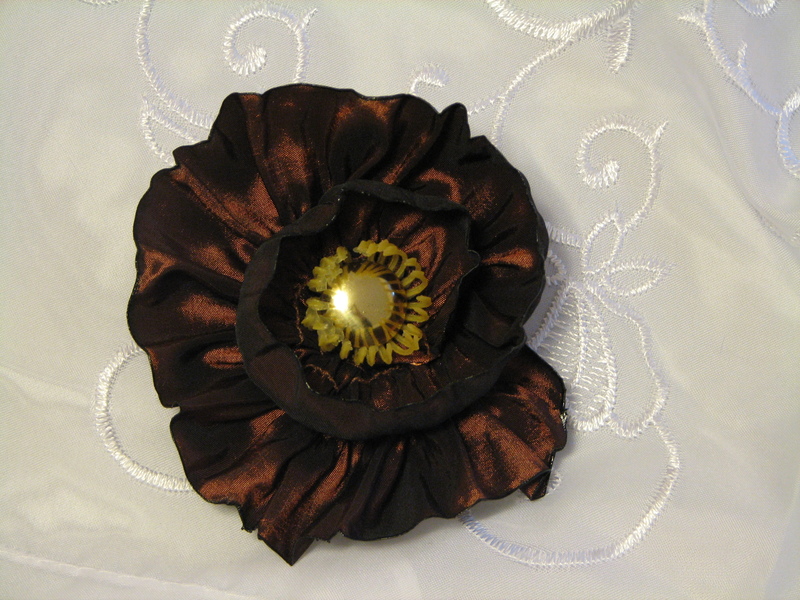 I sold this on Etsy to a fun person who is using it for her Mother Nature costume. Here is my second attempt. This was very time intensive because everything is wired and wrapped. It has sparkly beads throughout. And here is my third attempt. This one is girl size. 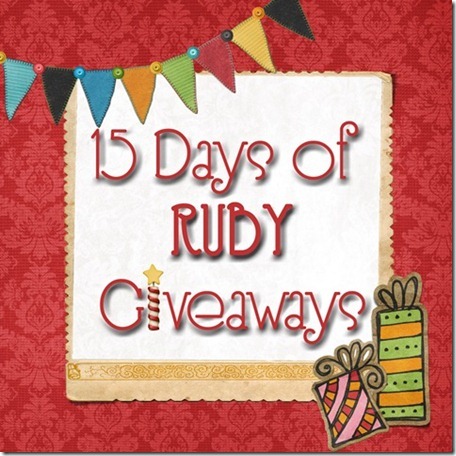 I’ve been having terrific fun working on my Etsy shops, but I decided to do a project just for myself. It all came about because of some silk vegetables. I saw them at an estate sale. They were brand new and so realistic. I kept asking myself what I could do with fake vegetables and resisted buying them until the last minute. As we were leaving I went back to look at them one more time. I just had to have them. So I paid the dollar and brought them home. They laid around the house for several months. I just kept moving them from location to location, basket to container, trying to figure out what I could do with fake potatos. 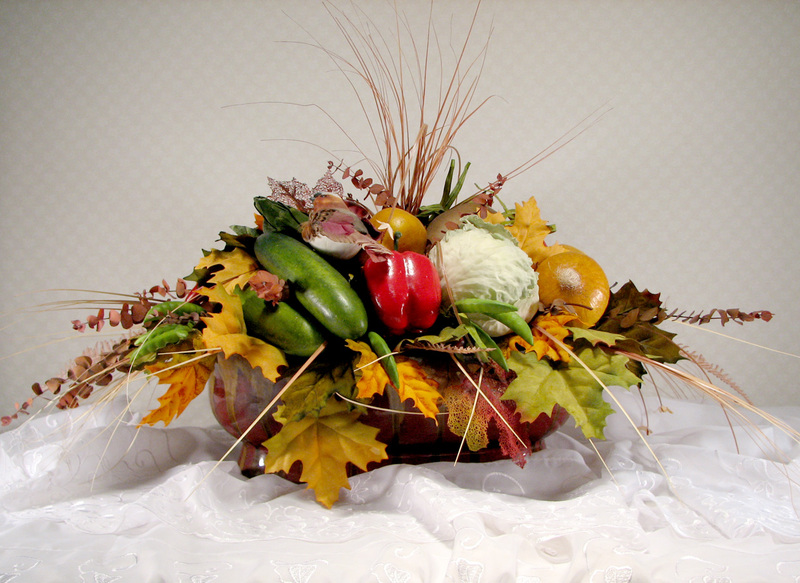 Finally I decided to really challenge myself and see if I could make a vegetable centerpiece. I thought it could be as fun as making a wedding bouquet with lights. I didn’t think I could do it, but it was one of those projects that just seem to come together by itself. I stacked three bricks of foam in the pot, one on top of the other and wedged more in on the sides. I think that was the trick. I put each vegetable on a long pick. that was the other trick. 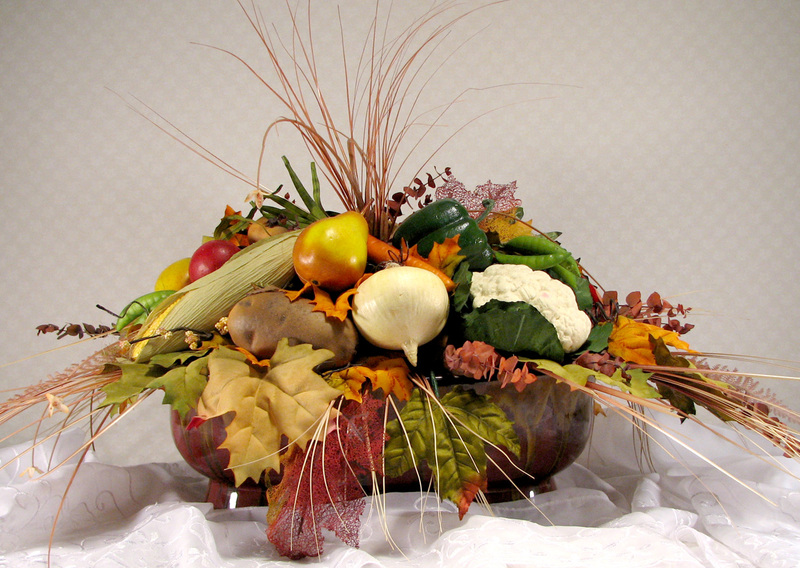 I covered the foam with eucalyptus and fall leaves then added each vegetable. I was so please with the way the vegetable nestled around each other. The peppers made me especially happy. I have a bird that has been in many of my arrangements. 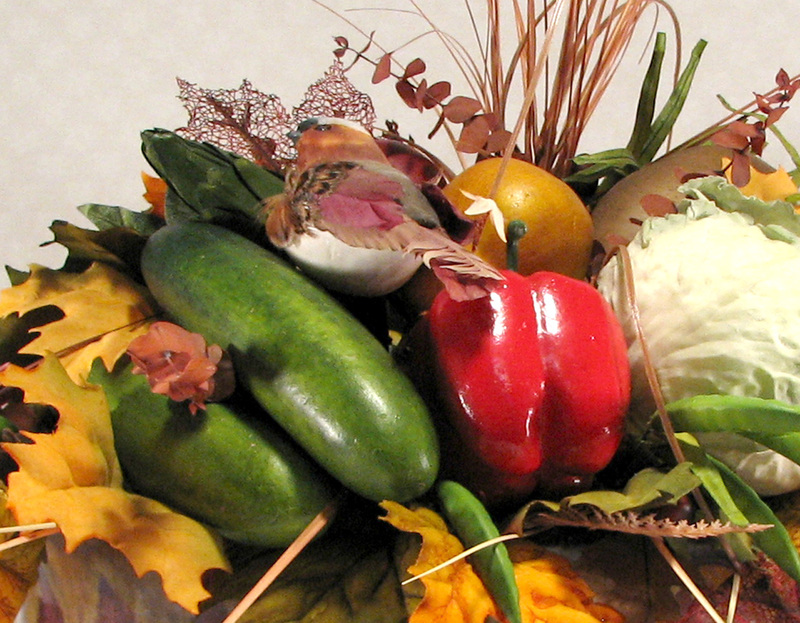 He made his way to this bouquet and is quite at home perched on a cucumber. 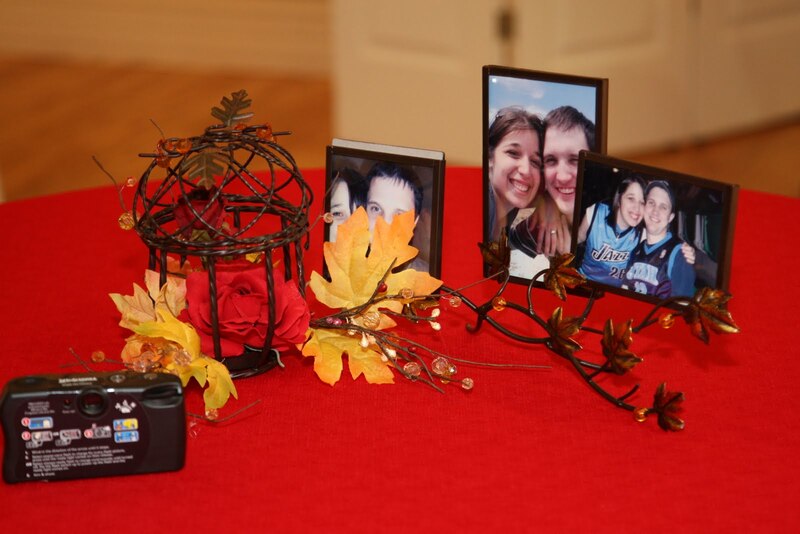 Here is the other side of the centerpiece. Etsy Shop: Business name registered…done, tax number……done, new bank account……done, Paypal account…….done, Etsy account…..done. When do I get to make crafts? Starting an ETSY shop is a lot more difficult than I thought. To read about my progress go to the Adventure in Etsy tab. 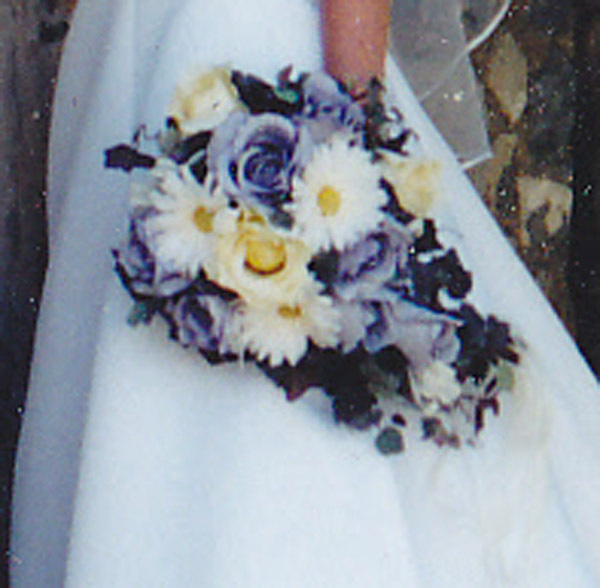 The bride picked out the gorgeous purple roses and wanted them combined with daisies. We always thought Jamie looked like Barbie. 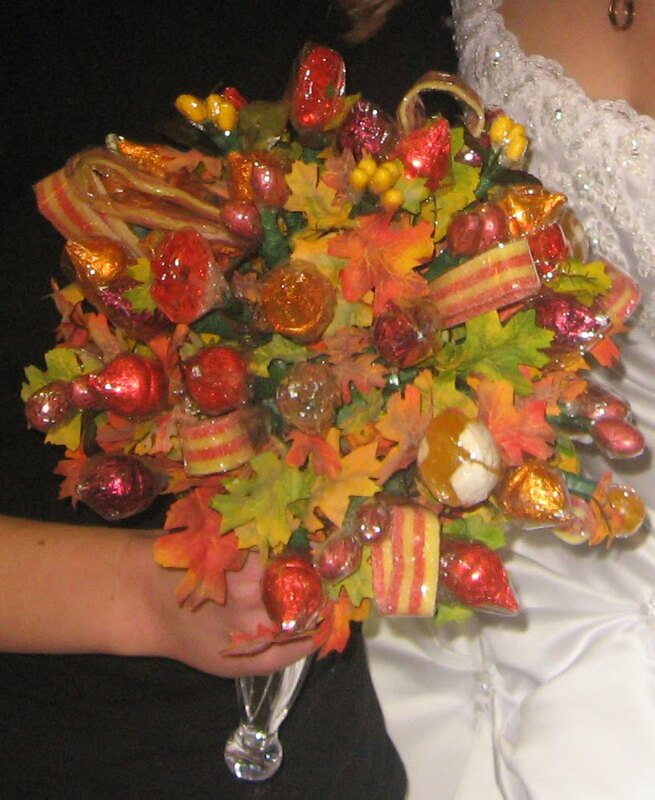 Here’s another shot of the candy bouquet. I made loops of the pretty yellow ribbon Christine chose and put them in a vase with the bouquet. We used it as a table decoration. 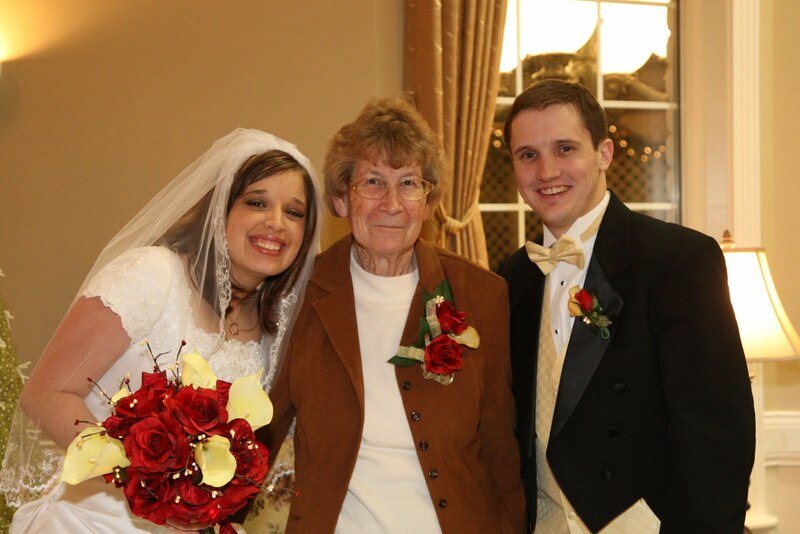 It was a good way to present the bouquet and have it ready when Christine needed it. 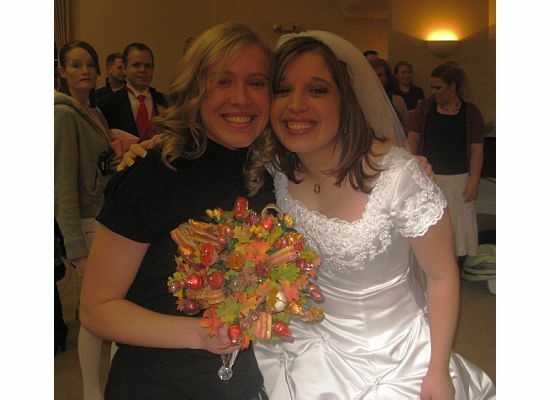 Here’s a good shot of the bride’s maids bouquet and my sweet children. 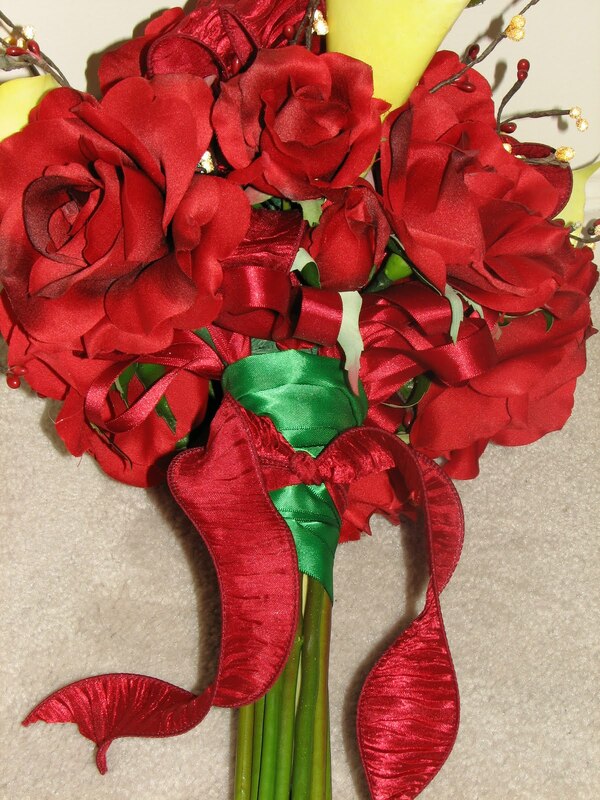 I think theses bouquets were the hardest to make. We found the lilies at JoAnn’s and they didn’t have long stems. I had to buy flowers just for their stems and the add them to the lilies. It was hard to make them look natural. 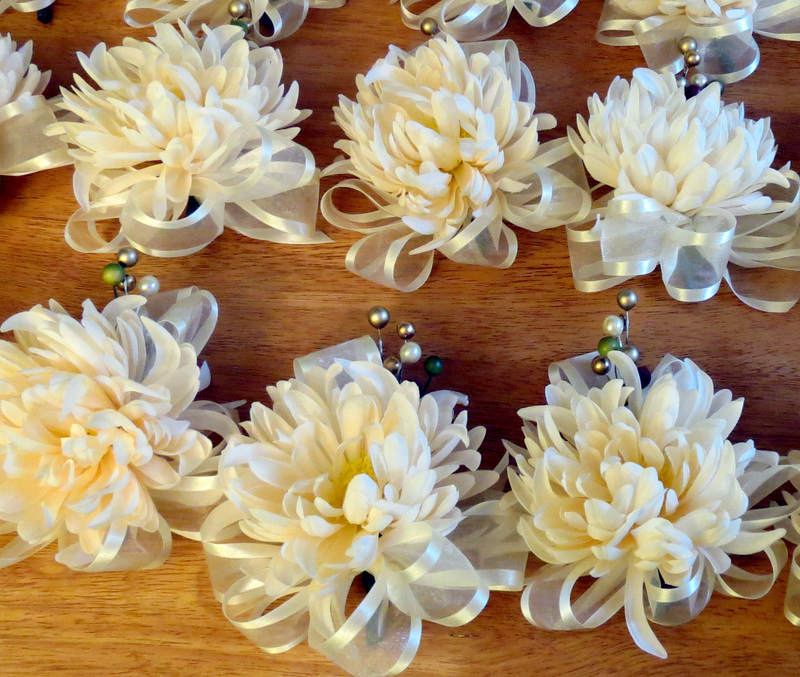 Here you can see an example of the mothers’ and grandmothers’ corsages and the boutineers. I cut apart the little yellow berries that were on stems and put them together in bunches to use for the corsages and boutineers. They look like lights in the pictures. 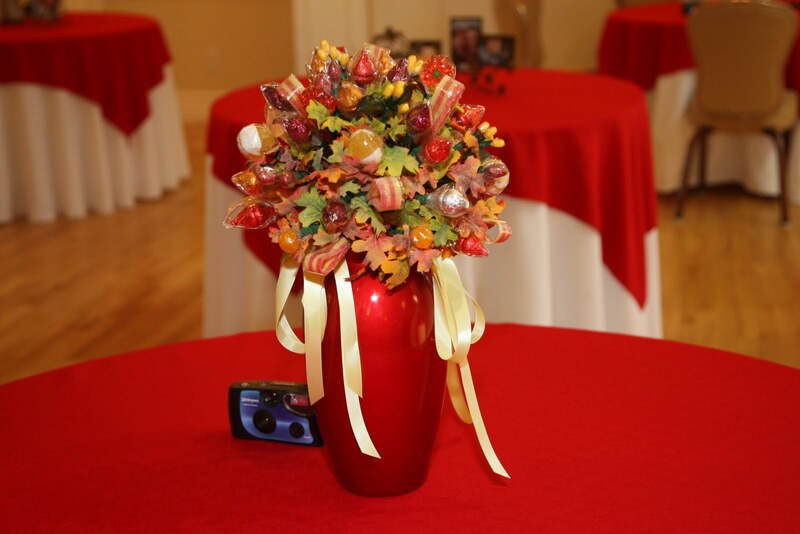 Christine and Adam told us they wanted a candy bouquet for Christine to throw. I said, “A candy bouquet,? can I make it for you?” They had a great idea and I had lots of fun making it. All the candy is wrapped in clear cellophane. I started with autumn color kisses. 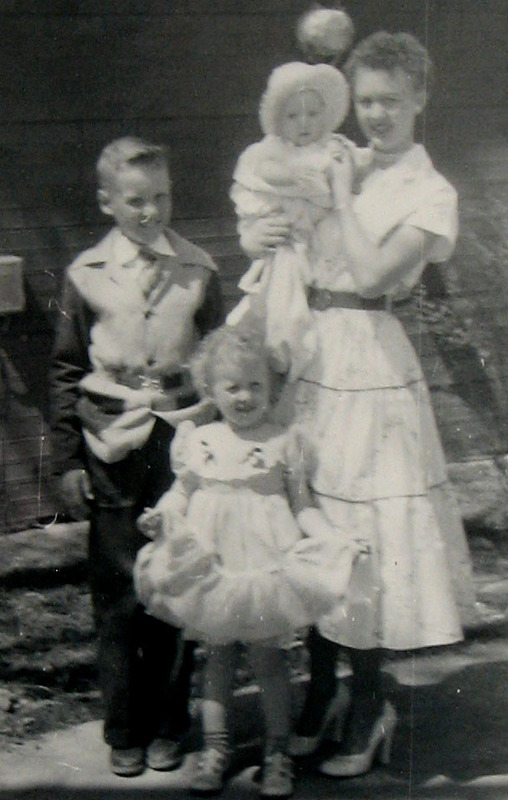 I knew how to put them together to make rosebuds, thanks to Young Womens. Then I searched high and low for something else I could add. I found some red specialty M.Ms. Then Mark came home one day with yellow and red Tic Tacs. The yellow Tic Tacs were a great find. I wrapped each one in cellophane and then wrapped them together in bunches. I did the same with the M and Ms. Then I had to find something that would look like a ribbon. I finally found some candy at the Sunflower Market. It was red and yellow striped. What a find! I just wrapped the candy in cellophane and folded it to make loops. I used fall colored silk leaves as a fill. 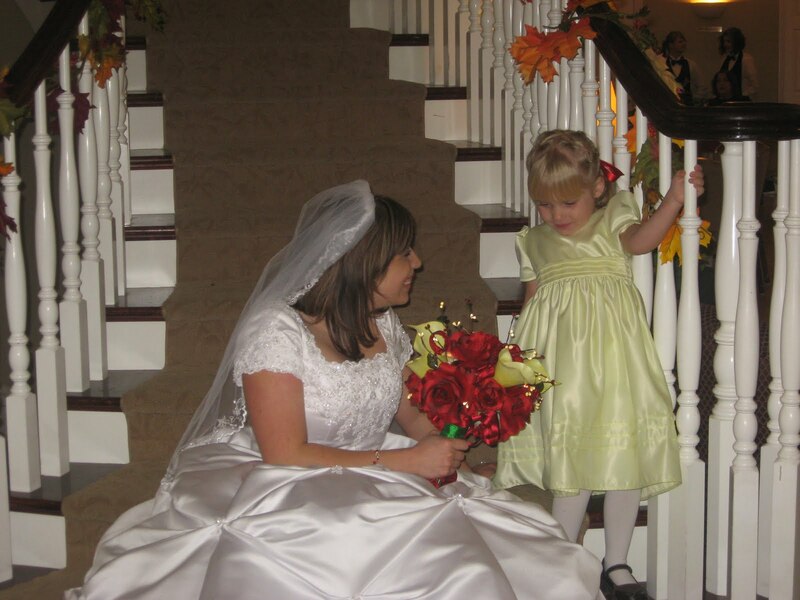 Here is my adorable new daughter-in-law who threw the bouquet and my adorable niece who caught it. 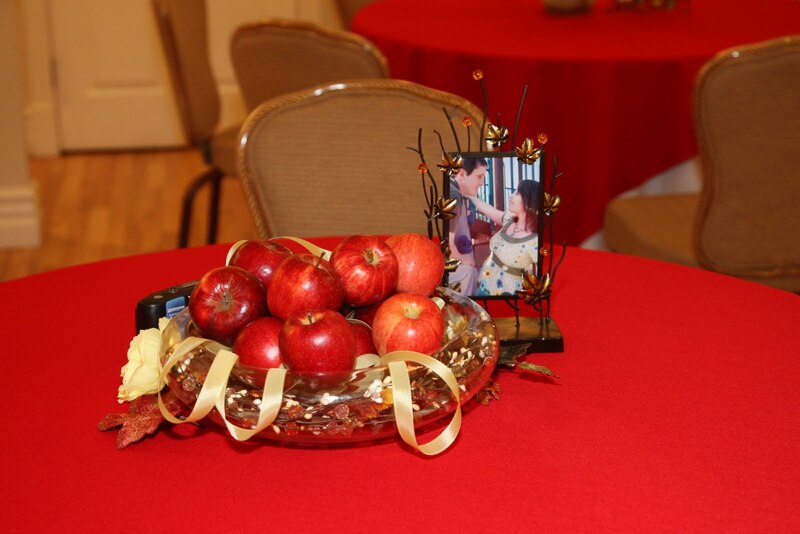 Christine picked pale yellow and red for her colors, beautiful fall colors. 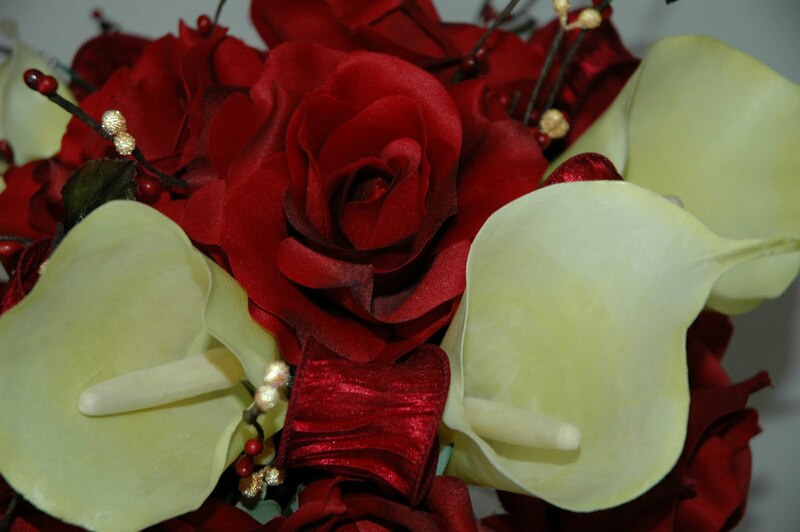 She wanted her flowers to be red roses and yellow calla lilies. I gave her the option of choosing real flowers and we would have a florist make them or if she was okay with silk flowers I would do the flowers. 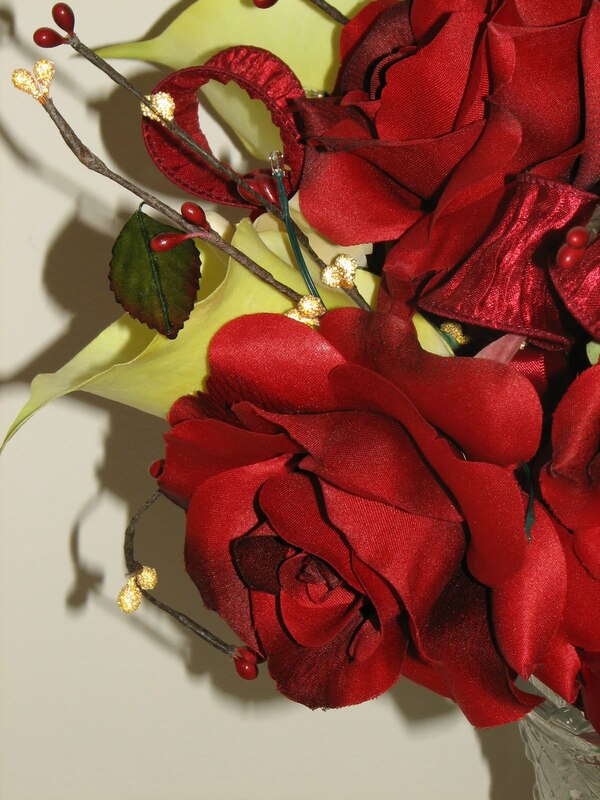 We checked out the flowers at Modern Display and found some wonderful stems of berries, red and sparkley yellow. Then we went to Michaels and Christine found some beautiful roses and just the right color of calla lilies. The roses were so pretty, she decided to do silk. (Or maybe she just wanted to please her new mother-in-law.) I was glad she would let me do her flowers. 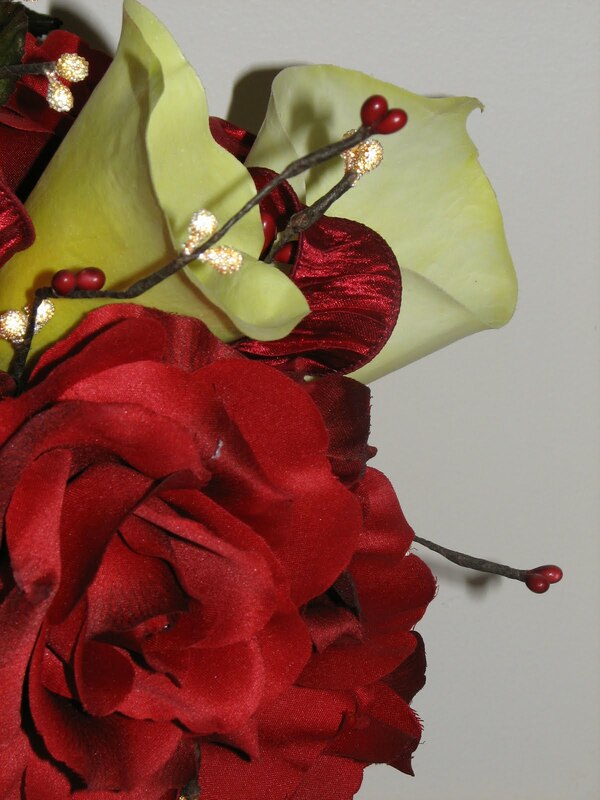 Here is a close up of the flowers, berries and the beautiful ribbon we found to go with them. While we were in the floral supply section at Michaels I saw some lights to put in bouquets. I showed Christine and we both thought it would be great to try to put lights in the bouquet. I say try, because I wasn’t sure I could to it. So I bought the package. When I got it home, I opened it up and saw that it was basically a very small box, just big enough to hold two batteries. There was no front on the box to cover the batteries, just batteries, 8 wires with lights on the end and a little lever to turn it on and off. 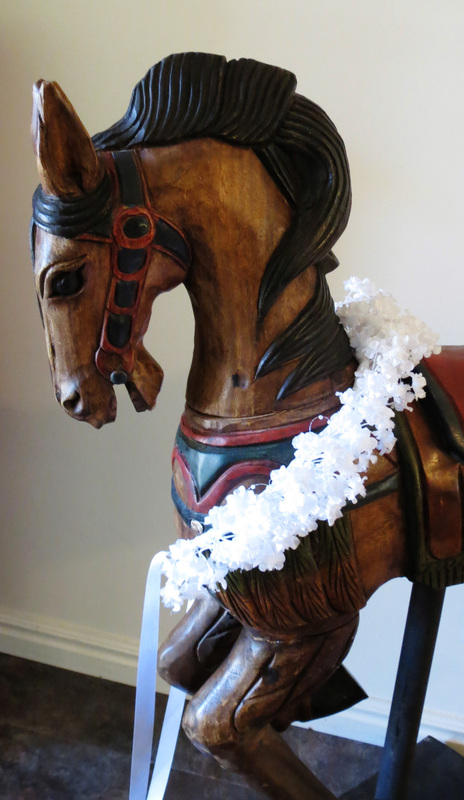 I nested the contraption into one of the calla lily stems and started the first round of floral tape to attach it. 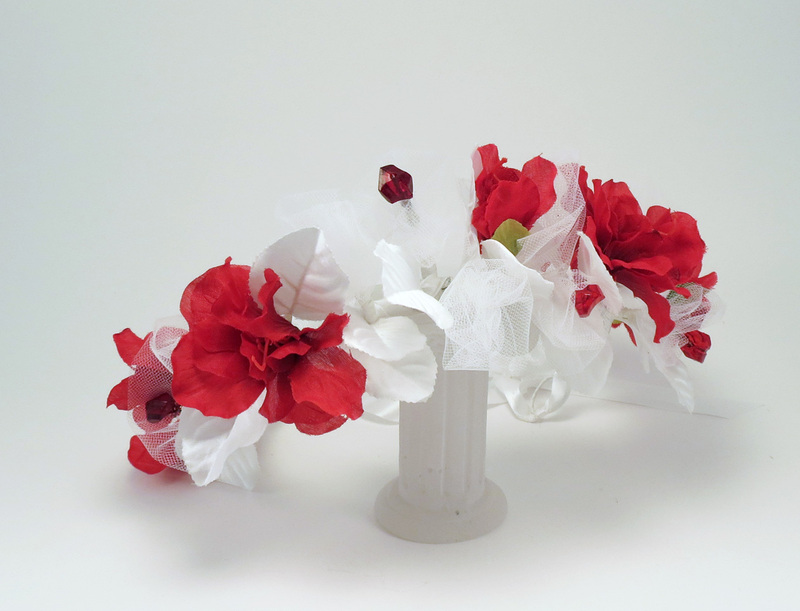 There is a lot of floral tape in this bouquet. Next I attached a rose to each of the eight little lights. It looks like a bomb in the making. 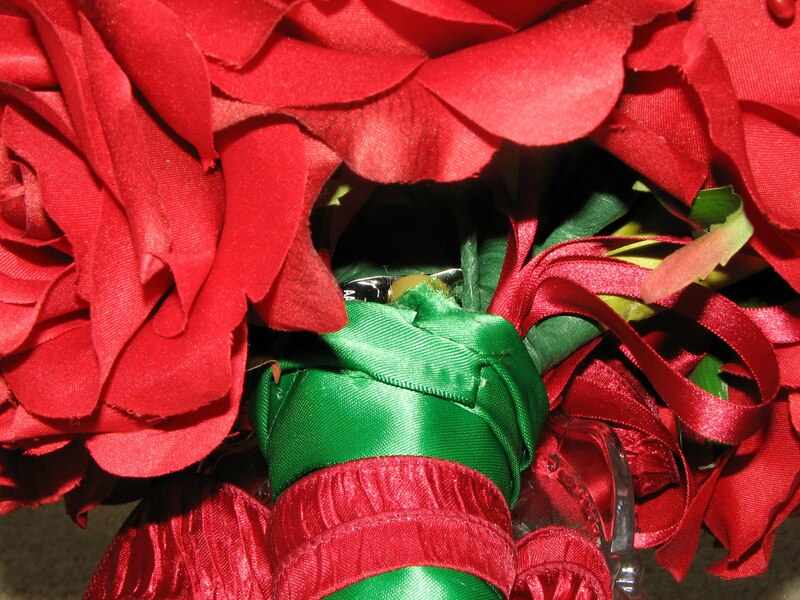 The picture below shows the battery nestled inside the bouquet. Christine turned it on by sliding the little lever over the top of the batteries to make the connection. When I was making it, I was afraid it wasn’t going to work because I added so many flowers, stems and wires with so much tape it misshaped the flimsy little box the batteries were in. The lights would come on, but not stay on. Luckily, when I got finished it worked. 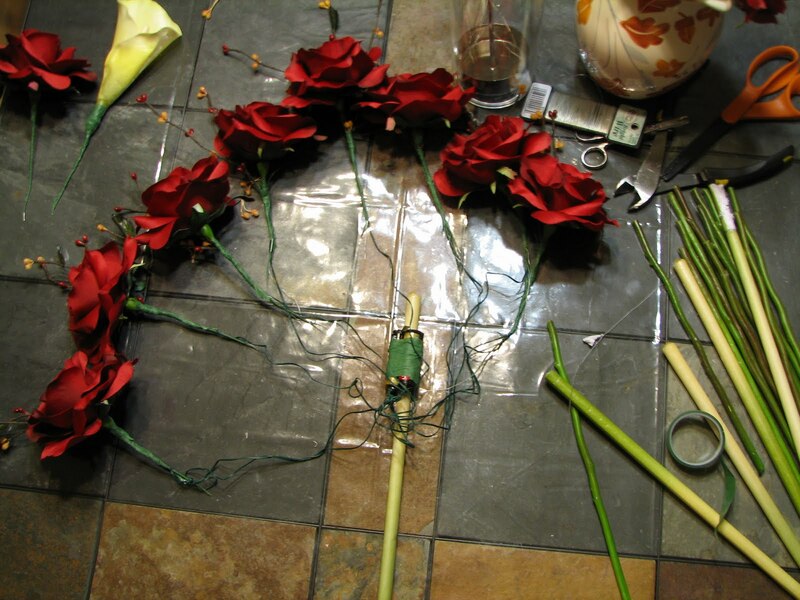 My next problem was figuring out how to make a nosegay bouquet with artificial flowers. I made one for Karena with real flowers and just cut of the bottoms of the stems, but when you cut into a artificial stem it’s ugly. You usually have a wire sticking out. 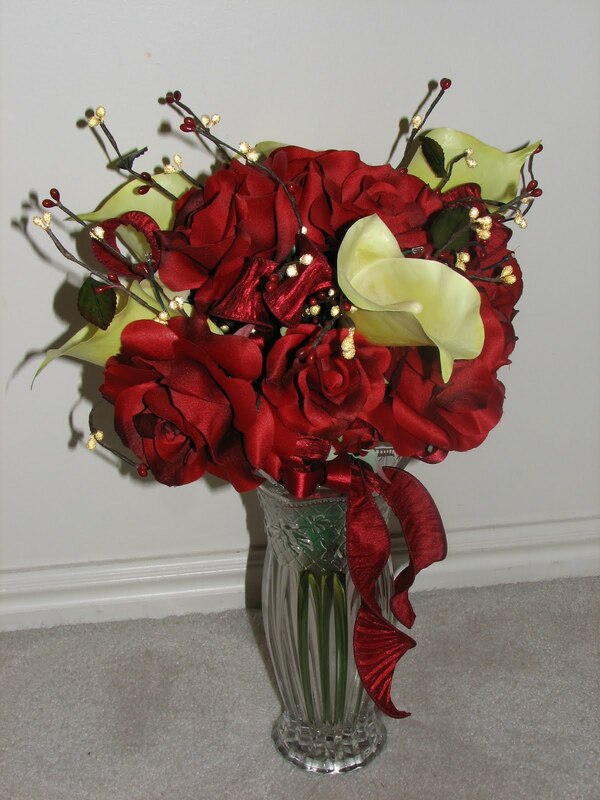 The rose stems were about two feet long and the calla lilies were even longer. They both had nice finishes on the bottom which I wanted to use. I had to cut the flowers apart and figure out how to put them back together. Here you see the blossoms and the stems off to the side. 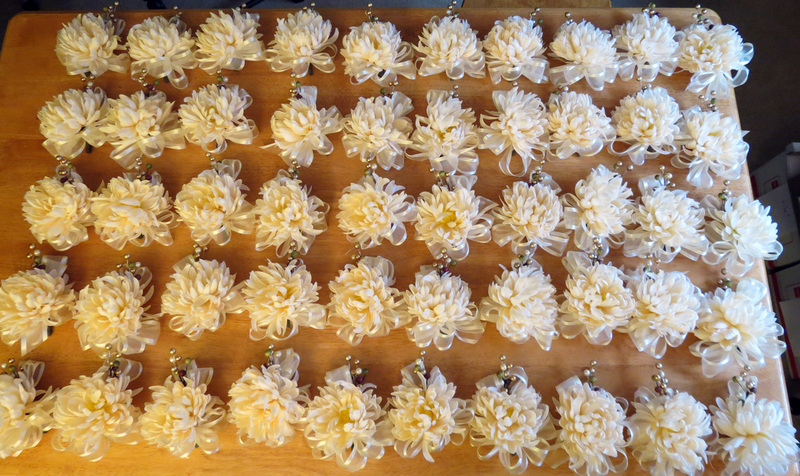 I always wire and wrap every flower, ribbon, and leaf I use. That way I have more control over the position of each flower. After I wired the roses I added the berries. I was carefully to choose stems of berries where the top berries looked natural, not loped off. I attached some of the roses to the stem bottoms and started adding them all around the stem that had the batteries nested in it. There were wires from the lights everywhere. 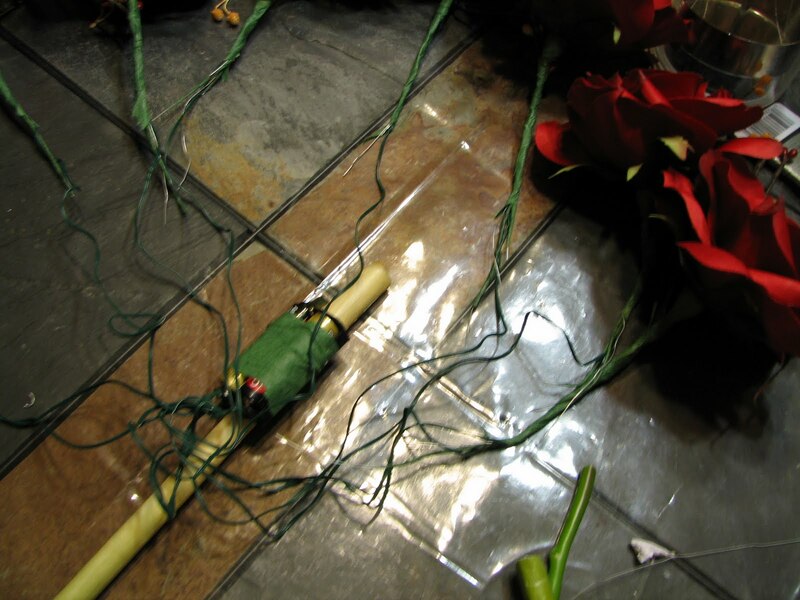 I gathered the wires around the stems and wrapped them with more floral tape, then added more stems. I’m kind of surprised I didn’t accidentally cut the wires. It took a long time to get the flowers into the shape I wanted and even then it ended up a little rounder than I had planned I think we both wanted a little more natural shape, but I’m not sure how you would do that and make it look nice around the edges. Christine wanted something dramatic and elegant and the choice of colors and the contrast of colors really were elegant. It called for a big bouquet and round worked out the best. 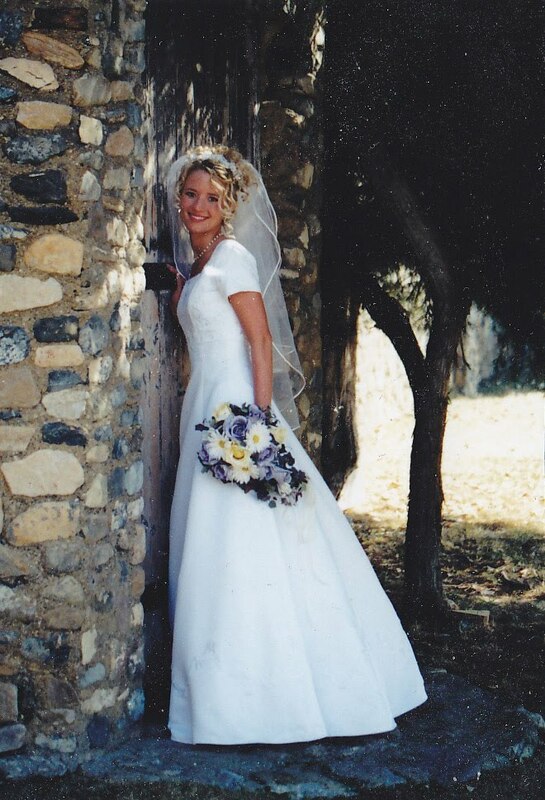 Two things I wanted… I wanted the bouquet to have a nice finished look and to be well put together… sturdy. I took great care to have the bottom of the stems and the underneath portion of the bouquet look good. Here you can see I added small loops of ribbon all around the underneath. No ugly floral tape here! 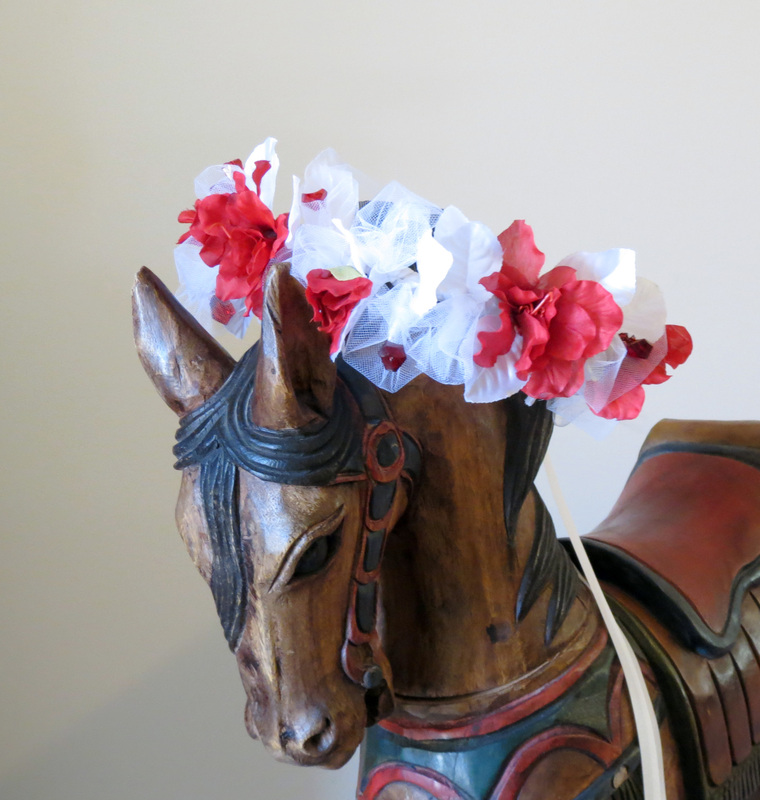 I wrapped the place where I joined the flowers and stems and hidden light wires with a green satin ribbon and tied it with the beautiful red ribbon. To make sure the flowers didn’t fall off, I bought a contraption, like a giant staple, that I used to secure the flowers before I wired them. It worked well. 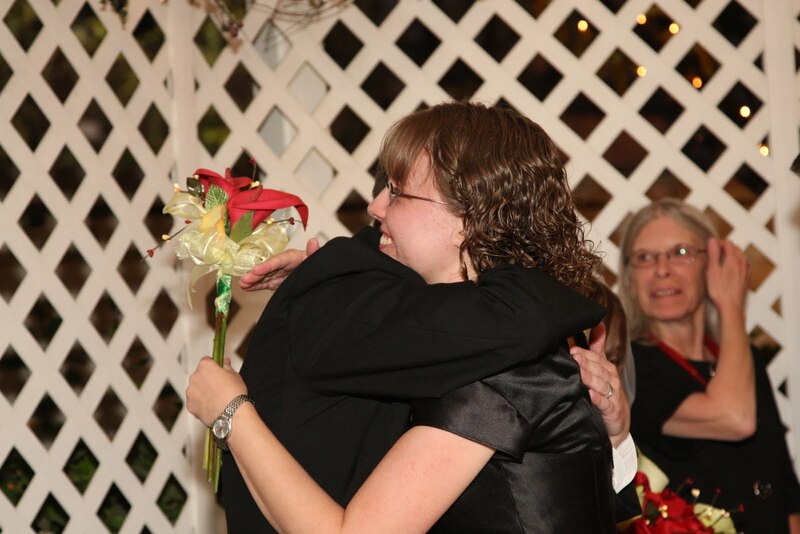 The wedding was a joyous occasion and the bouquet had to do its part. Here’s Christine and Madeleine admiring the bouquet. The lights are on, but you really can’t see them in this picture. What you are seeing are the sparkly yellow berries. What a pair of beautiful young ladies.